For my last class, I came up with a nifty bracelet design from sweater felt. I think I have worn it every day- or nearly so. It was a favorite how-to project in class that day too. I had a few more cute ideas so I made some kits for you. Good time to clear out the wool stash for spring. And- I also managed to tackle a downloadable PDF! Or you can get the kit. It has the same full-color illustrated instruction/pattern sheets and a selection of felted wools in springy colors. Fun stuff! Hop over here to order. I am trying to learn new systems and programs on my computer and have to say, it's a challenge. Some people excel at one thing more than another. I think Ruth Edwards would understand. Spring,1929 must have been quite a distraction when it finally came. And wouldn't she be horrified to see her failing (yes, it got worse) exam books being sold at a flea market. For a dime a piece! Looking at these over-sized yarn balls, I can't resist saying something about wrapping up .... the pieces of heart series .... the winter blahs ..... suburban seclusion .... snow shoveling ... scarf bundling. Ready to move on. This window in Soho perfectly captures my sweet day yesterday. Erin and Mo were both here for meetings in the city. The week's weather buried all the original plans, but finally the sun came out, the blizzard moved out to sea, roads cleared, the trains and planes resumed their schedules. Friday morning: shuttled Erin to the commuter train to the city, got Grammy to PT, picked up Mo from the airport, dropped her at MSG, collected Erin at 28th/Madison ..... still only 11:30. The two of us headed south a few more blocks to snow-ho Soho. Farther in to a warming winter day with blinding sunshine, fun-house shadows and reflections. We garaged the car, hit the streets and just wandered along with everyone else so happy to be out. Enjoyed catching up over dim sum. Watched the chic sidewalk scene from the chocolate bar. More catching up. 12:18 to 2:12. Wrapping up just two little hours that felt like a full week at the beach. I thought of the days when she was a little girl, those spontaneous adventures, just the two of us. On the way back to the car, arm in arm, she said, Do you know that Lou Reed song about the perfect day? No, I don't think I do. Well, today is that song. Today was just like that! Just wanted to remind you all that Squam Art Workshops registration begins today. 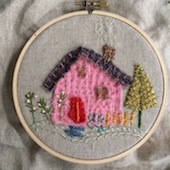 I'm teaching at the Spring session June 2-6 and my classes are this Stitch & Stash Book for a half day on Saturday and the much-loved Felt Cottage on Thursday and again on Friday. Please visit the site for registration and more information. I am so looking forward to sharing this event with you.We can sit by the lake or under a pine or on the cabin porch. We can sew and learn and chat and enjoy this incredibly beautiful place! Really, I just can't wait to be there!